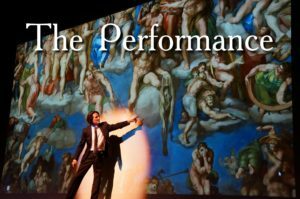 DaVinci & Michelangelo Battle of the Titans - Theatre Performance shared a link. Leonardo da Vinci's natural state of mind was to integrate art, design, engineering, and science. Leo would have gotten the refraction inside the globe right, right? OMG....what a story. DaVinci & Michelangelo Battle of the Titans - Theatre Performance is at DaVinci Exhibition - The Machines & You Exhibit - North America. 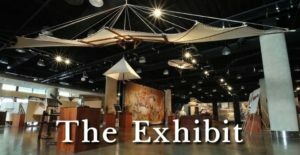 (Translated by Google) I was on a business trip to Denver and had the honor to come across this graciously decorated museum. As soon as the front door came in, Director Mark Rodgers greeted me. He had such enthusiasm that he immediately put me under the spell DaVinci's & Michelangelo's! He was able to tell me the genesis of every picture of Michelangelo and every DaVinci machine. Since I was not the only one in the business, he juggled skillfully between all the customers back and forth to ensure everyone the maximum learning success. After an hour of fascination, I came to the exit and the souvenir shop, as I unfortunately went to the museum without much money, I could not buy anything. Mr. Rodgers was so nice and gave me a "DISCOVER THE DAVINCI IN YOU" bracelet which I still wear. 10 out of 5 stars, thanks to the director of the exhibition lives! Ich war zur Dienstreise in Denver und hatte die Ehre über dieses liebenswürdig eingerichtete Museum zu stoßen. Kaum die Eingangstür rein, begrüßte mich der Director Mark Rodgers. Er hatte solch eine Begeisterung in sich das er mich sofort in den Bann DaVinci's & Michelangelos zog! Er war in der Lage mir zu jedem Bild Michelangelos und jeder Maschine DaVinci's die Entstehungsgeschichte zu erzählen. Da ich nicht der einzige im Geschäft war, jonglierte er gekonnt zwischen allen Kunden hin und her um jedem den Maximalen lern erfolg zu gewährleisten. Nach einer Stunde Faszination kam ich zum Ausgang und dem Souvenir-Shop, da ich leider ohne viel Geld in das Museum ging konnte ich mir nichts kaufen. Mr. Rodgers war so Nett und schenkte mir ein "DISCOVER THE DAVINCI IN YOU" Armband welches ich immer noch trage. 10 von 5 Sternen, dank des Directors der die Ausstellung lebt! Thank you so much Philip. We hope to meet again. Painter, sculptor, inventor, engineer, mathematician, anatomist: has anyone ever surpassed the genius of Leonardo?